With a population just short of 800,000, Vancouver Island is the largest island on the West Coast of North America, and is comparable to the combined size of the Netherlands and Taiwan. It is separated from the BC mainland by the Strait of Georgia to the east and, to the south and southeast, from Washington State by the Strait of Juan de Fuca. Nestled off the coast of Vancouver Island, and between it and the mainland of British Columbia, lies an archipelago of more than 200 islands, many populated with year-round residents, and always a get-away location for local and international visitors. Goods are transported between the mainland, Vancouver Island and the Gulf Islands by ferry, adding cost and logistics issues to supply chains. Neither the economic challenges, nor the geographical trials daunted Kelly Hawes, CEO and owner of ColdStar Solutions Inc., which Hawes started in 2000, “with one truck and an idea.” The idea with Cold Star Freight Systems was to change how food was coming to Vancouver Island, and Hawes says, “It’s a unique area for shipping refrigerated product, it is so expensive to get things across on the ferry, and at the time truckers were hauling anything and everything all together. I looked at that and thought, there should be a carrier that specializes only in hauling food and does it in a food-safe way.” Some years after starting his freight company came an opportunity to take two successful Island businesses and merge them to create a company whose sole focus is to enhance the grocery market on Vancouver Island and the Gulf Islands. 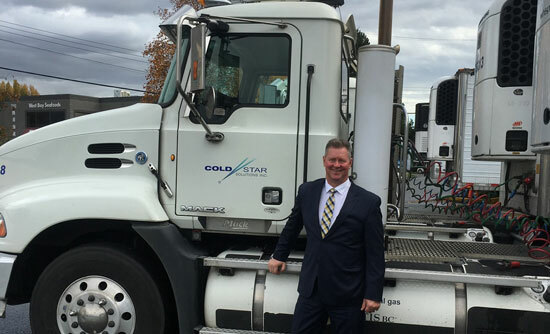 On July 1, 2014, ColdStar Solutions Inc. was formed by a merger between Victoria based Wilson Foods (1994), a Victoria grocery wholesaler, and Cold Star Freight Systems Inc.
Hawes is particularly pleased with the Food Safety program. “I approached the BC Trucking Association, explaining how I wanted to be a food-safe trucking company pointing out there was no regulation in place, and no way to prove to the big food suppliers we were in fact operating how we said we were.” The BC Association put him in touch with the Canadian Trucking Association and ultimately through that connection, Hawes developed and convinced twelve trucking companies across Canada to run a year-long food-safe pilot project. He says it took a further year before the Canadian Food Inspection Agency (CFIA) certified the plan. The program is now run by Iron Apple International, a leading provider of professional food safety solutions for companies involved in the transportation of food products throughout North America. Members from the food trucking industry are audited on a regular basis and certified that they are meeting all the food safety standards required by CFIA. “It took a long time to get that program in place, but we’ve followed those protocols from the beginning. The big food suppliers bought into that and still use our services to this day.” Hawes explains that while local food retailers, who do not pay for ColdStar’s cold-storage and delivery services, (it’s the food manufacturers that pay), recognized their food items were arriving in better shape and lasted longer on the shelves. “As a transport company, there’s only so much business you can do, and we had already achieved a generous share of the market, so we got into public cold storage. Then, with our freezers full, the merger opportunity came about. That was a massive jump in revenue and gave us a lot of pieces of the puzzle that helps us drive the cost down in getting groceries to the retailers on the Island.” He cites an example of being able to buy groceries out of Toronto, and using the company’s facilities and trucks, can leverage its partnerships to make prices competitive for Vancouver Island retailers. Hawes says that the company uses BC Ferries as well as Seaspan Ferries Corp. to transport from the mainland to the Island. He agrees that transport challenges do arise when transporting food product to the smaller Gulf Islands, especially when it comes to less than a truckload (LTL) loads. The mainland warehouse facility, located in Richmond, features a 42,000 sq.-ft. warehouse 20 minutes from BC Ferries Tsawwassen Terminal and approximately 30 minutes from the Canada/U.S. border. The dock and freight handling area are maintained at a constant temperature of two degrees Celsius. The Victoria warehouse is 36,000 square feet, from which half a million pounds of product is moved each night. The Victoria location also houses the company’s Produce Division. “We’re not only transporting food product but we’re also buying and selling groceries, everything from frozen, dairy and dry goods, with a separate Produce Division.” The Ladysmith Cross Dock Facility is strategically located just south of the Nanaimo airport and just 15 minutes from BC Ferry’s Duke Point terminal. The building boasts 25,000 square feet of dedicated space, of which 15,000 sq. ft. is refrigerated and 10,000 sq. ft. is frozen.